I'm a snacker. Especially when I'm watching TV. It doesn't matter if it's candy, chips, strawberries, or whatever else I have on hand; for some reason when I watch TV, I just want to snack. I will say that I do try to snack smarter, and by that I mean healthier. Although, sometimes an apple is just not as fulfilling as a bag of chips. Anyways, this is where Love With Food comes in. I was drawn in by their snack promises of 8 or more varieties per month delivered right to my door. Most of the time, these are varieties I've never even heard of. As someone who love snacks, I couldn't say no, and since I was referred, I got my first box free! (Well, had to pay $2 for shipping and handling, but I'm not complaining). You can get your first box for 40% off, just follow this link and you'll be on your way to getting your first box of yummy goodies delivered to your door. 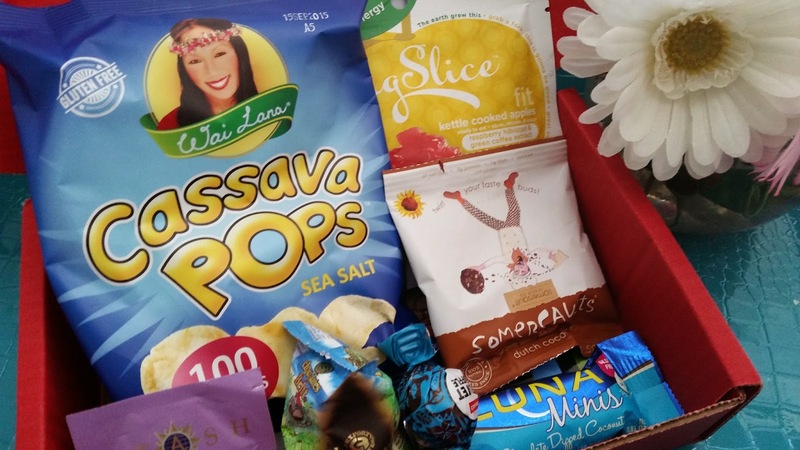 If you are new to Love With Food, they are a snack subscription company that offers monthly snack boxes. There are 3 types of box subscriptions and the one I have is the Tastings box. It offers 8 or more varieties of snacks per box and for every box you order, they donate 1 meal to hungry children in America. According to their website, they have so far donated 400,757 meals! As of now, they only ship within the US and territories. However, maybe that will change in the future. 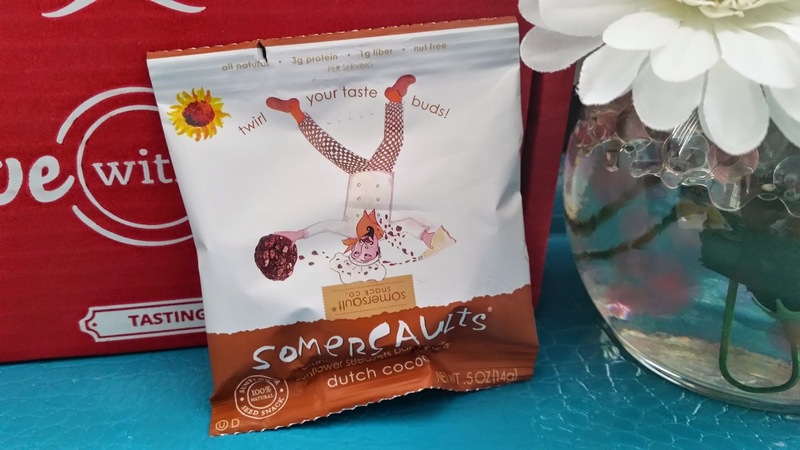 I have discovered so many yummy snacks since I started my subscription in November of last year. In Novermber's box, I fell in love with the Grain of Health's Red Rice chips, they looked plain but it was delicious and simple. 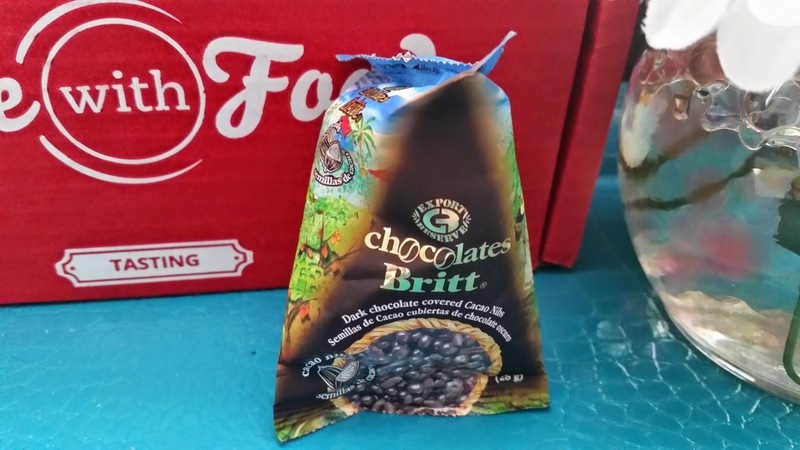 In December's box, I fell in love with Oogies Kettle Corn and Liddabit Sweets' Dark Chocolate Sea Salt Caramels. Both of which I plan to repurchase because of their amazing flavors. Now, let's see what's in January's box and if I fall in love with any of them! The snack is named after the company, hmmm. I have to say, I'm not the biggest fan of this. I love the idea of putting seeds and grains with chocolate, but their execution wasn't amazing. I wish there was more chocolate flavors. The roundish disks made it feel like your biting into a small piece of rock, it gets softer in 3 or 4 chews but it's not very pleasant at first. I think it would work out better if they made the pieces thinner and the disks larger. On a plus side, this is a non-GMO snack. I have mix feelings about this one. When I first tried it (as I was watching the Food Network), I really liked it. However, midway through the package, I found I was starting to get annoyed by the cacao nibs. Instead of eating the dark chocolate and cacao nibs, I just ended up letting the dark chocolate melt in my mouth and throwing out the cacao nibs. This is just a personal preference, but maybe I'm just not such a big fan of nibs in my chocolate. Okay, I was kind of sad that I only got 1 piece of this. Small snacks like these usually comes with at least 2, so this was definitely disappointing. 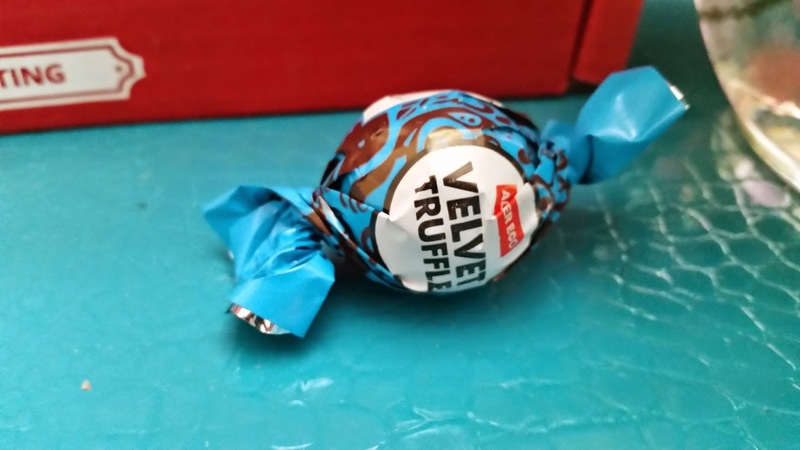 To me, this truffle wasn't anything special. It doesn't taste bad but it's not to die for. It is, however, organic, gluten free, and non-GMO. So, if you are looking for truffles like that, you might want to give it a try. 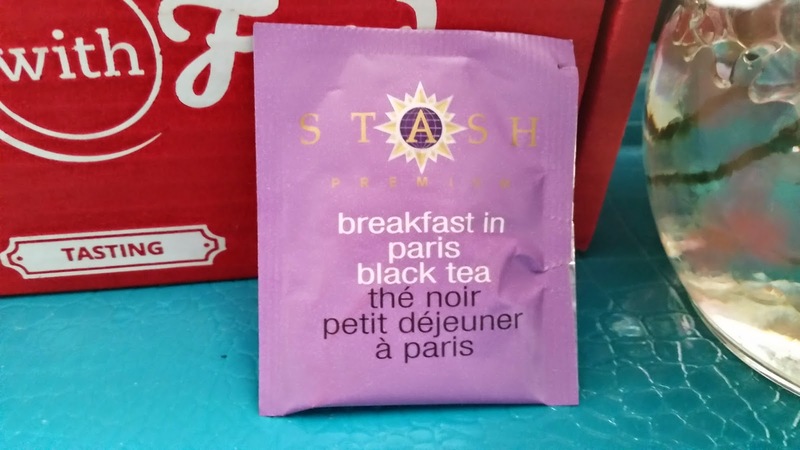 The other small, 1 time item in the box, tea. I love tea, a lot. Having had quite a lot of tea in my life, I can be picky about them. Haven't tried this one yet so I'm not sure how I feel about it. However, like the snack above, I'm sad that it only came in a single bag. I have heard of this brand before, although, I've never tried anything from them. Chocolate and coconut are 2 things that I love, so I hoped for a great pairing. These turned out to be very delicious. It's a great flavor combination and the mini bar makes for a great snack. I will most likely be buying more of these in the future! These minis are also only 90 calories and gluten free. This, I was super excited for when I saw it. It sounds delicious and comes in this good sized pouch. I took it to work the other day to have it during lunch, however I forgot to bring a fork. That's the downside of this pouch, you need a fork and it doesn't include one. Luckily, there were some in the staff room, so I was saved. The taste? Not as amazing as I thought it would be. It wasn't bad, but I found I didn't like eating it by itself. I had brought Hawaiian bread rolls with me for lunch so I added these to the rolls, which made it a lot better. So I think these would be great in parfaits or on waffles. These were so delicious and definitely my favorite in the box. Generally, sea salt chips, or in this case pops, sound rather plain to me. However, these are not plain at all. The Cassava tastes great and I wish I had more once I finished the bag. 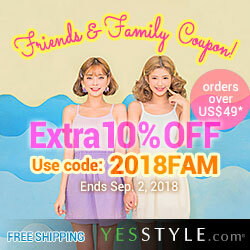 Will definitely purchase more in the future. 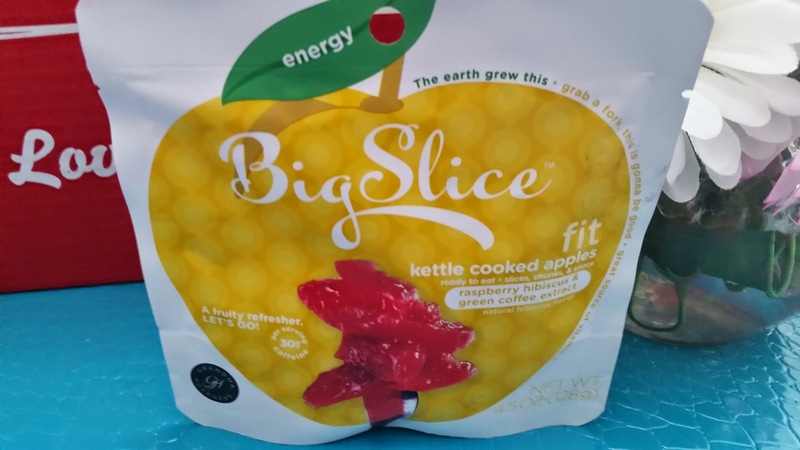 The small packages are great for on the go snacks to work or school as well. 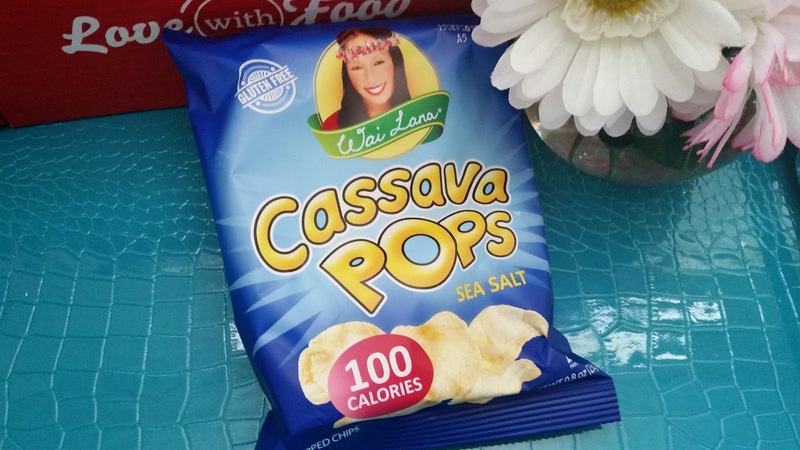 These Cassava Pops are gluten free, non-GMO and Vegan. There was a hiccup with the picture for these almonds. I was getting ready to take their picture, when I was stopped by the door bell. Ran down stairs to answer it and after I came back, they were gone. Turns out, my mom who came to visit that weekend saw the nuts and thought I already took the picture, so she helped herself to them. By the time I found the missing almonds, there were just 2 left. Two! I had one lol. They tasted just like the average almonds, not bad but nothing special. Unless, of course, you count the fact that their shells are still on as the special factor. I guess they are trying to act like pistachios, but so failing. Final Thoughts: This January Love With Food box is pretty good. There wasn't one item in this box that I hate, which is new. It's not a super amazing box, but it did contain a great variety and plenty of new and unheard of snacks. 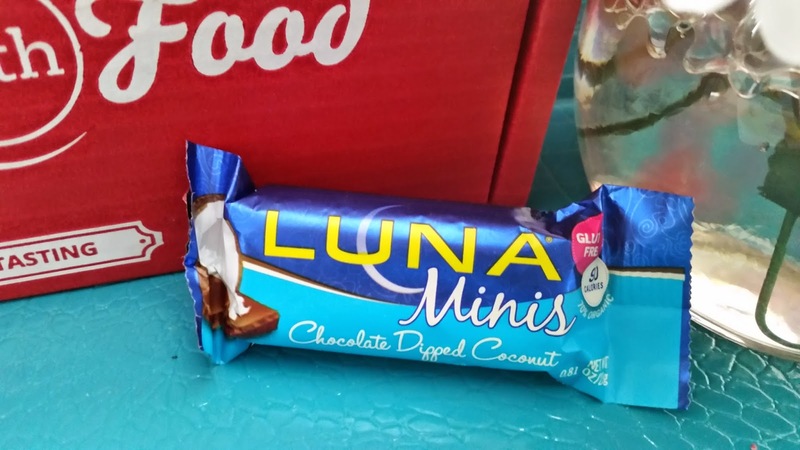 I think, the snacks I fell in love with this month are the Cassava Pops from Wai Lana and Luna's Chocolate Dipped Coconut Mini. They are just delicious and perfect for on the go. I am super excited for next month's box. I hope for more yummy goodies and a large variety. Maybe I'll find my next new love in snacks! 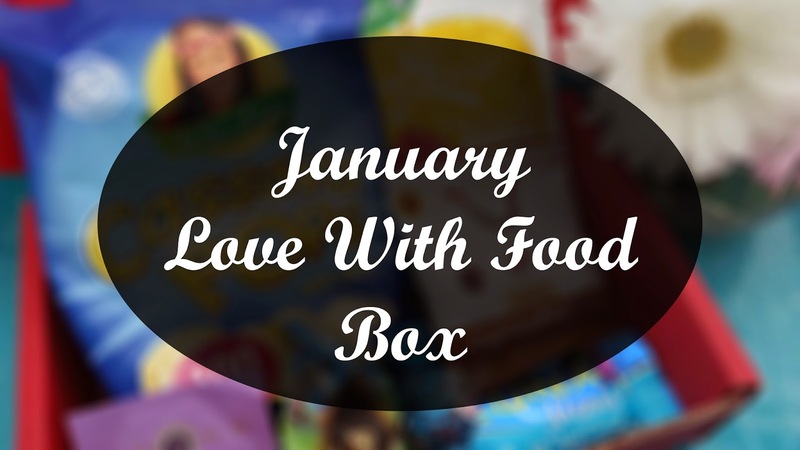 Did you get January's Love With Food box?